Ok, so here's a pretty brilliant game design contest: The Video Game Name Generator Competition. Basically, you had to go to a website that randomly creates a video game name for you, and design a video game based on that name. Given that they have screenshots with the names, they are all pretty darn amusing. At some point I will probably even risk the downloads of a partially completed joke (or not so jokey) game to see how they play,especially given that people actually went through the time and effort to do this. After all, after watching Nintendo just hammer out game after game with word Mario affixed to the title, it's time for some new IP (intellectual property). Who knows what horrors could possibly await at "My First Skydiving Academy?" Or what the learning value of playing "Obsessive Compulsive Penguin Simulator" could entail? And who would want to miss the amazing action of "Morbidly Obese Rugby Nation?" But I guarantee you, nothing can prepare you for the carnage that must entail in "Papal Shotgun Gladiator." Ultimately, the concept for the game started with my 4.5 year old daughter (of which you can see some of her fine artwork here). We finished a game of Gulo Gulo, and as she usually does after playing a game with the rules, her innate game design genes kick in. And the next game we are playing is of her design, pretty much making things up as we go, using the parts of the game we just finished. In this case, her variant of Gulo Gulo involved random draws of the colored eggs from the mixing bag that is provided with the game. And after a few draws, it started feeling like something like this could turn into a GDS entry. The planet card aspect of Captain Tempest wound up coming from the October 2003 copy of Games magazine, that I had recently found. Inside was a 1-page game called "Perfect Union," designed by Dave Shapiro. It's a simple area control game with the theme of an early 12-colony election, where each state was valued at different "electoral college" points. While not much of the actual Perfect Union game was used, the image of the various states and their point totals stuck with me, and became the other main focal point of the game mechanics. The "board" is shown off to the left here, in all of it's scanned in goodness. At this point, the game was fairly themeless; simply drawing colored wood cubes to stake an ownership on a planet. But, this is a GDS entry, and I've found that theme often plays a much more important role in these contests. With not much else to go on than 800 sparsely written words, abstract games never fair well; the theme is often the hook that the people voting can most easily grasp, and will often overlook better games with lesser themes, if only because the theme lets them visualize things with a bit more clarity. So, it wasn't much of a stretch turn the cubes into asteroids, and from there, creating a reason to be hurling asteroids at planets. The last piece of the puzzle is probably the name. I decided that coming up with a name that evoked some recollection of old science fiction serials would be the best, as opposed to just a simple declaration of who the players represent. When viewed through the sepia colored memories of old black and white Buck Rogers movies, this creates an even stronger imprint of a look and a goofy breezy fun, and slightly goofy, feel of that style. The name of Captain Tempest really came from searching for a name that could somewhat match those of Flash Gordon or Buck Rodgers, and Nick Fury popped up, as another pulpy hero name; 1 syllable first name, 2 syllable last name and all. From there, it was another small leap trying to find a word that had the same imprint as Fury; hence Tempest. Astro-Patrol simply completes the retro feel. And yes, much like Flash Gordon, the name is kind of jokey. Of course, this desire to go towards 1930's serials probably wasn't hurt by the fact that I had seen Sky Captain and the World of Tomorrow recently. But why is it the last episode? Well, since Captain Tempest and his band of do-gooders never arrive "during the game" to save the solar system, he has clearly lost. And the fact that he's isn't even a part of the game is part of the joke. Due to the constant interference of Art Deco space-hero Captain Roger Tempest and his Astro-Patrol, the Council of Galactic Evil has decided that it's just better off to destroy the entire Earthen solar system than take it over. They do this by launching numerous asteroid attacks to destroy each planet. Good-bye Captain Tempest!!! Of course, as always with the Council, every villainous deed becomes just another excuse to argue over who is the most villainous. Cloth Bag of many small same-sized plastic molded Asteroids, in 9 colors (1 color for each Planet). The Asteroids are roughly the size of small wooden cubes. Nine Planet cards (color-matched to the Asteroids). Players are members of the Council of Galatic Eeeevil. Player start the game by drawing 6 random Asteroids from the bag into one hand. This hand is where they will keep their stock of Asteroids, which must be kept secret from others. Draw 2 Asteroids at random from the bag. Return X Asteroids from their hand into the bag(showing the discards to their opponents), and drawing X replacement Asteroids into their hand. Draw 1 Asteroid and declare a Planet Attack. When a player declares a Planet Attack, he announces a Planet name from the un-collected Planets that remain "to be attacked." Each player now selects Asteroids from his stock, and places the selected Asteroids in his other hand. All players reveal their selected Asteroids. Whoever reveals the most Asteroids that match the color of the announced Planet is the player who gets to carry out the nefarious attack with a large, chew-the-scenery evil laugh, and is considered to be the winner (of this attack). If there is a tie among any amount of players for the winner, then the player who declared the attack is considered the winner, regardless o how many matching Asteroids he had selected. The winner returns all matching color Asteroids in his selection hand to the bag. He must also return an amount of Asteroids to the bag that is equal to the value shown on the Planet card that was attacked. These Asteroids come from his stock, and can be any color. If the player does not have enough Asteroids to cover this cost, he discards as many as he can; regardless, he still wins the card. Players who did not win keep their "bid" and return their Asteroids to their stock. Once there is one Planet card left, the last Planet Attack is to be declared immediately by the next player (in other words, the last two Attacks will occur right after each other). The game is over... When all Planet cards have been collected, the solar system has been destroyed!!! The game is over. Players reveal their remaining stock. All Asteroids in a player's stock of each color that are singles are kept; matching color sets of Asteroids are discarded. A player's score total by adding all of the Planet values shown on their collected cards, and then subtracting the amount of Asteroids they still have in their hand (after colored sets are discarded, as noted above). The highest score wins, and is deemed to be the most evil member of the Council. I've been away from the wired world for a while, waterparking with the kids at Grizzly Jacks. So, instead of responding to the comments of the last post in the comments, I figured I'll use the power of the RSS feeder to answer the questions. The hook for PocketCiv would simply be "solitaire Civ game." The hook for One Against the Dead would be "Solitaire Zombie game with household components." Of course, I've decided to blow away that hook, and am slowly working on a more story-driven basis for that game, while keeping the slightly strategic elements of city building/zombie creation. But that's sort of slow going at this point...creating all of the story points and arcs is turning out to be a larger time-consuming project than I have imagined. The other project I'm working on is the resusitation of KitchenTable. The more observant may have noted that it has magically appeared in the 'Places to Play" link off in the sidebar. This is my attempt at a game prototype engine that can support multiple players, that I had given up last fall with the introduction of Gabob and Zun Tzu. However, these don't seem to appeal to a few members of BGDF, so I've gone back and started working on it again. The multiple player is currently turned off to chase down gamebox creation bugs, there's no documentation, and it's being debugged by a few BGDF chat people, but it's there for people to play with. And, of course, there's no promise that I'll ever finish it, and give it up further along the line. 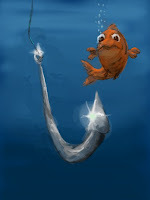 And yes, "The Hook" image was created on the DS Colors program. In a recent discussion on the BGDF chat forum, I’ve found that some people may, or may not, know about this little trick in the game design world known as…The Hook. Since I haven’t been feeling rather design-y recently, The Hook might be a nice little discussion point worth posting about. Again, it is important to realize that this is NOT really what the game is about (even though, in some cases it can overlap). This is the one simple thing that a player can grasp that “reels them in” into further play, or even the interest of playing the game. This is important because, if you cannot identify The Hook, then there is a good case to be made that the game itself is pretty bland, and there is nothing much more you can do to fix it. Conversely, if you CAN indentify The Hook, you will understand that almost all functions and systems of the game hang off of it and support it, making a much stronger game in the process. If you feel that the game is “too heavy,” it is probably because there’s a rule or mechanism in there that doesn’t support The Hook, and can easily be removed, often improving the game. Puerto Rico’s hook is “building the most efficient machine.” That’s it. Note that there is nothing in The Hook that describes it’s theme, or it’s somewhat unique role-selection mechanism (and yes, I know there have been role-selection games before hand). In fact, PR's hook itself is not that innovative, as many games can be thought of as “building the most efficient machine.” But this is the thing that gets player to come back and play it again; with each play, the player picks up a better understanding of the various interplay between the buildings (and to a lesser effect, the way the worker resources energize the buildings and plantations) in determining how to avoid the inefficiencies of previous games. Some games are often harder to find The Hook in them, or have multiple relational Hooks. The Princes of Florence, while it, too is a “efficiency builder” has an additional relational Hook, which I think is the bigger Hook for a new player in the game. The big hook for PoF players is "play Tetris in a board game". Remove this element, and while you may have a nice game there, but there'd be nothing remarkable about it. In this case, the hook defines a fairly unique application of how the game works. I suppose I should note that you aren't REALLY playing Teris, but the whole puzzle solving aspect of packing in various oddly shaped pieces matches well with that description. It should be noted that in the two above examples, there really isn't much thought given to the theme of those games, especially with regards to their Hooks. The games, themselves are fairly themeless once you remove various typefaces and graphics. I've always found it amusing that in PoF you are supposedly attracting artisan's to your little art clubhouse and having them produce their wares, but you never actually SEE or feel an artist, and their supposed "art" they are producing is merely a card with a lot of stats on it. These are effectively themeless games, with a theme attached to them. As an opposite example from above, I present Ticket to Ride, which has a hook that is very similar to it's game description: play sets of cards to complete tracks. The Hook here is "Building a track layout to complete city connections through simple card play." As much as I tried to keep the word count down to a minimum here, I felt that the card play aspect of the game is the thing that really carries it; there are plenty of other train games out there, but TtR is the game that I think solves the solution simply for the average player "to get," and to pick up and play often enough. And in this case, some allusion to the theme is appropriate...slapping a non-train theme on to this game is most likely inappropriate. Of course, I've applied The Hook to three Euro Designer games, but it can be applied really to any other game. In some respect, The Hooks of various games are defined by the family in which they keep. "Trick taking/avoiding game" all share the same hook, as described by their family trait, with maybe an additional comment with regards to what defines the trick. Wargames are somewhat all similar, given that thety can be block-styled, or card driven, or action point driven, or what have you. The important thing, however, to take from this is that once you have found a Hook, it is important to make sure this is the heart of the game, and all other mechanics "tendril out" from it and support it. Otherwise, it gets lost, and the game will be confusing at worse, or just meandering, at the least.